You can show off your own graphics, or request some to be made. I'll do any requests I can, and anyone else is more than free to post/answer requests. Last edited by Bewood; 08-14-2014 at 11:55 PM. 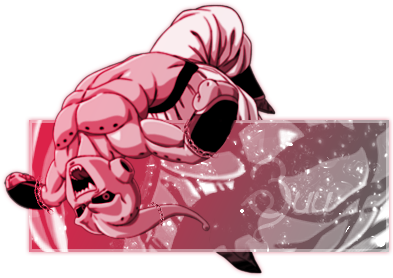 that BUU is damn badass . can i request ? but im confused which, LOL is cintro and coldboot different ? A soundboot is the sound that plays when you first turn on your PSP. It's found in flash0/vsh/module and is named opening_plugin.prx because it is a file from your flash memory you will need to find one that matches your firmware version. To view it you will need to enable "view hidden folders" and also "show system folders", but there's a "feature" of vista that hides system folders even if you enable "view hidden folders". A coldboot is an image the pops up when you first start up your PSP. It is found within the opening_plugin.rco and must be a specific image type. Check the tutorials on making your own coldboot for more detailed information (two large headings down). The placement and the image itself can be edited. An XMB wave is pretty much self explanatory. It is the wave that shows up when browsing the XMB, you can see it if you go to the settings menu, then go to theme settings and set your background to classic. It doesn't show up anywhere else and the file itself is within your flash 0 and is the file called system_plugin_bg.rco . It also does not affect anything else so fiddle with it to your heart's content. And thanks! I made the Buu one a long time ago, on here, I believe. And you can request anything you want. so Cintro and gameboot is better can you do a customized Death note theme with my sign or desired name? I can't do entire themes. oh, many beautiful themes. thanks man.